Media captionCan going to the dentist really become a walk on the beach? Could sitting in the dentist's chair really be as enjoyable as a walk on the beach? UK scientists found that putting patients in a virtual reality (VR) environment while being treated can reduce anxiety levels. The researchers said this "bottled nature" approach could help many people get past their fears - but not all. Those who experienced a more urban VR environment in the study did not receive the same benefits. The findings have been published in the Environment and Behaviour journal. "Our idea was that if we bring nature into a stressful situation, such as the one in a dentist's surgery, then that should have a similar benefit as when people are able to go out into nature," explained co-author Sabine Pahl from the University of Plymouth, UK. "We know about the benefits of the natural environment in psychological and physiological terms - people can feel relaxed and restore their cognitive resources. "We also know in dentistry, there is a high percentage of people with dentist anxiety and their teeth tend to be in a worse state and they tend to miss appointments because they are worried about going to the dentist; and that, of course, has an effect on their teeth. "We are trying to intervene in that dental anxiety process," Dr Pahl told BBC News. Because it was not possible to walk on the beach or in the woods while receiving treatment in a dentist's chair, the researchers decided to "bottle nature" and allow patients to experience it via virtual reality technology. The team's study involved 70 patients, divided into three groups: one receiving standard care, without the use of VR technology; another being treated while experiencing an urban environment via VR; and a group experiencing a VR beach (nature) environment. "What we found was that the experience of pain was much lower among the people in the nature VR group," Dr Pahl observed. "This finding is important to us because people could say that it was just the distraction provided by VR, but the difference was stronger in the nature VR than in the urban VR. "In fact the response among patients in the standard care and urban VR groups was more or less the same." Dr Pahl said the finding that there was a clear difference between the experiences recorded between the VR nature and VR urban groups did surprise the researchers, but the importance of being immersive in a natural environment had been supported by previous studies. A study in 2015 by researchers from the universities of Exeter and Plymouth found that people who spent time in aquariums could improve their physical and mental wellbeing. As well as improving people's mood, the study revealed a "significant reduction" in participants' heart rates and blood pressure. The dentist involved in the study, Melissa Auvray, said that anything that could help patients was worth investigating. As she had a professional interest in the science of sedation, she was keen to be involved in the research. "The benefit of the VR is that with sedation patients need to have someone with them to help them home afterwards, and the dentist and dental nurse need further training," Ms Auvray said. 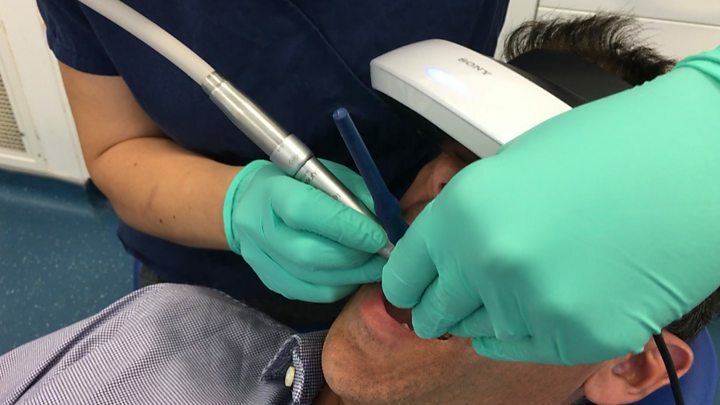 "However, with the VR, any dentist with a dental degree could learn to use the VR kit, and it could benefit patients." He told BBC News that as with all things dealing with anxiety, the use of VR to replicate the natural environment was not going to help everyone. "But, I think, for patients that really struggle to have treatment but can just about manage to sit there and bear it, it does make it easier for them. "Anything that helps you forget about pain is a good thing because if you do not remember something being painful then you are more likely to return, and return regularly, which in turn results in less intervention and treatment." Dr Sabine added that the researchers had followed up with the patients some weeks after the treatment and the positive response among them had remained, which suggests that the anxiety process in people's minds was being interrupted. There are commercial firms establishing themselves in this area, offering services to ease anxiety and discomfort. But the researchers voiced concern that the systems were not being tested properly, which could undermine the potential gains that this technology could provide. They explained that there was a need for the actual content of the immersive experience to be assessed, such as walking on a beach or in urban areas, because - as the study showed - there was a real difference among patients' responses to different environments, from helping ease anxiety to offering no real help at all.